On the 9 July 1921, a Dublin boy, Paddy O’Connor made his way to the hills around Donohill,South Tipperary, looking for Mrs Quirke’s house. He was a messenger and had come all the way from Dublin with an urgent message for Ernie O’Malley, the commander of the IRA’s second Southern Division. O’Malley was effectively head of his own mini-republic in rural Tipperary, where British forces rarely ventured and when they did, took care not to leave the roads. The war there was increasingly bitter. Three British officers, unlucky enough to fall into O’Malley’s hands some weeks before, at a time when three IRA Volunteers were being shot by firing squad in Dublin, were coldly put to death in reprisal. When O’Malley returned to his safehouse, the boy, who had refused to discuss his business with any of O’Malley’s subordinates, handed him a message from Richard Mulcahy, IRA Chief of Staff. It read; In view of the conversations now being entered into by our Government with the Government of Great Britain, and in pursuance of mutual conversations, active operations by our forces will be suspended as from noon, Monday, 11 July. O’Malley wrote later that he was ‘bewildered’ by the order. The first senior IRA officers had heard of the Truce was this, ‘bald message’. Nevertheless, he had orders typed out and sent to the five IRA Brigades under his command across Munster. The bones of a peace deal had been on the table since the previous December – a British offer of Dominion status for an Irish state on the same territory as Southern Ireland, the Home Rule entity outlined in the Government of Ireland Act of 1920. Lloyd George’s British government was left with essentially two remaining options. One was to fight the campaign as real war, declare martial law across the 26 counties designated as Southern Ireland, up the levels of troops and adopt a policy of wholesale executions and internment of suspected republicans. Plans existed to start this phase by 14 July. Did the will exist on the British side to really go through this draconian policy? Their Commander in Chief, in Ireland, Neville Macready, for one, was against it, ‘there are of course one or two wild people about who still hold the absurd idea that if you go on killing long enough, peace will ensue. I do not believe it for one moment but I do believe that the more people are killed the more difficult a final solution becomes’. The other option was a final attempt at negotiations. This was the policy favoured by most of the British regime in Dublin Castle and especially the Under Secretary for Ireland, Andy Cope, who had been desperately disappointed by the failure to reach a settlement in 1920. By this time, Eamon de Valera, the President of the Irish Republic, was back in Ireland from his fund-raising campaign in the United States. Ironically in view of what happened afterwards in the Treaty negotiations, de Valera was indentified by the British as a moderate force compared to the young firebrand, Michael Collins. A flurry of talks took place between July 4 and 8 between de Valera and Lord Middleton with a view to securing a truce and on July 9th , a truce was formally signed between two members of the Dail cabinet, Robert Barton and Eamon Duggan and British military commander in Ireland, Neville Macready. Under its terms, British forces were to cease, ‘pursuit of Irish officers and men, or war materials or military stores’, while the IRA were to cease, ‘attacks on Crown Forces and civilians …[and] British government and private property’. The news of the truce was hurriedly conveyed from the clandestine IRA leadership in Dublin to commanders around the country. 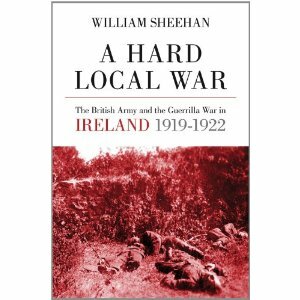 The cover of William Sheehan’s ‘A Hard Local War’ shows the bodies of four British soldiers killed in Cork city on the eve of the truce. In many places, the IRA had a final crack at their enemies just before the truce came into effect. On July 10, just a day before the truce which ended the war, the Bailieboro Volunteers in county Cavan, who had done little enough during the conflict, attacked the RIC barracks in that town – 30 strong, armed only with shotguns. The attack was beaten off with two IRA wounded and two more captured. In neighbouring Kerry, nine men, (four British soldiers and five IRA Volunteers) died in a bloody gun-battle in the village of Castleisland on the morning of July 11. In Belfast, the day before the truce was a day of carnage, known at the time as ‘Belfast’s Bloody Sunday’. Loyalists, incensed by an IRA ambush in the city the previous day, attacked the Catholic enclaves in the centre and west of the city. Loyalist groups, the police and IRA blazed away at each other from rooftops, windows and street corners with rifles, machine guns and grenades. By the time the day was out, 16 civilians were dead and 161 houses destroyed. The sectarian body count was heavily in the Protestants’ favour – 11 Catholics for 5 Protestants and 150 Catholic houses destroyed for 11 Protestant. For all that, as of noon on Monday July 11th, most of the guns did indeed fall silent. IRA commanders such as Ernie O’Malley may have felt bemused by the sudden end to hostilities but the response of the general population, it seems clear, was elation. In Tralee for instance, the townspeople took to the streets, letting off rockets in celebration. The ex-soldiers’ band played Irish national airs and ‘the populace cheered wildly’. IRA men, who a day earlier might have been shot on sight, traded, ‘good natured banter’ with the Black and Tans. One activist in the town, Christy O’Grady, noted grumpily in his dairy that, ‘Sinn Fein colours were prominently worn and by people whom I never saw very fond of it’. ‘Sinn Fein colours were prominently worn and by people whom I never saw very fond of it’. Dublin was reported to be ‘calm’ rather than ecstatic, but everyone noticed immediately, ‘the complete disappearance from the streets of military and police lorries and armoured cars’. One republican in Kingstown(now Dun Laoghaire) harbour hoisted the Irish tricolour over his yacht in celebration. British troops who rowed out to tear the flag down were ordered to put it back up again by their officers, while, ‘a great crowd cheered’, on the pier. Ernie O’Malley retired to his quarters to discuss the unexpected outbreak of peace with his officers. Much later he concluded, ‘and so ended what we called the scrap; the people later on, the trouble and others, fond of labels, the Revolution’. Today,Ireland commemorates the truce of July 11 as the National Day of Commemoration. But in fact the truce was the end only of a phase in the conflict in Ireland. Within a year, many of those on the republican side in 1921 would be fighting one another over whether to accept the compromise offered by the British. British armoured cars, like this one, were withdrawn from the streets after the truce. It is perhaps best then to conclude with a note of ambivalence, expressed by the above-quoted Monaghan Volunteer, ‘During the period of the truce, the politicians and respectables took over. It was they who interpreted our dream, the dream we fought for. It was they who decided the terms to which we must agree. In the mind of every [IRA] soldier was a little Republic in which he was the hero. But his dream was shattered’. Shattering this dream, or to put it another way, enforcing the compromise that came out of negotiations with the British, would mean that the truce was only a pause and not the end of the war in Ireland. Written by: John_Dorney on 11 July, 2011.on 4 January, 2015. 10 Responses to "Today in Irish History, The Truce, 11 July 1921"
I really enjoy your articles, John. They are always very thoughtful and enlightening. When reading about this period in Irish history, I often wonder if it was really the truce and not the treaty that sealed Ireland’s fate. Those who agreed to it must have known that a truce inevitably leads to negotiations that involve compromise necessary to accommodate both parties. Broken truces on the other hand lead to a return to the status quo–in Ireland’s case, more tiring guerilla warfare with fewer weapons, and perhaps a stepped up effort on England’s part which may have broken the Irish resistance entirely, and then a return to being an occupied and crushed people. In my opinion, the decision to end hostilities and to put cards on the table was as significant as the treaty itself. HI Lisa, well the IRA at the time, by and large welcomed the truce as a respite. Most people at the time saw it as a victory for the Republic. If it led inevitably to civil war? I’d blame the Treaty itself more to be honest. Negotiations were absolutely inevitable in 1921. Thanks Lisa, it’s in all good bookshops! As ever, very well written, John. I do like the balance you achieve in all your posts. Maybe only experience can bring moderation.